As we wade into the chaotic waters of December this year, my heart is a little unsettled. Part of it is that I already feel behind and we’re only three days in. But part of it is the kind of ‘unsettled’ that indicates a rattling around my conscience, soliciting change, or at the very least a careful examination of whether things are as they should be. See, I love Christmas. I love giving gifts, love making and following family traditions, love Advent countdowns and Christmas carols and stockings… But the frantic pace (and overwhelming quantity of it all) seems to increase each year, with a corresponding increase to my unsettled feeling. The thing is, it’s not even the kids’ hearts that need adjustments (though raising entitled kids is one of my primary worries as a parent). If I’m honest, it’s my heart that needs refocusing. If I want our family Christmas to be focused on Christ, then I need to prioritize celebrating the coming of our Savior in my own heart and actions. So we’re rearranging the way we do Christmas a little… We’re still figuring out exactly how the changes will play out (I love the want-need-wear-read idea [though my kids ‘need’ section might be a little bare], the gold-frankincense-myrrh idea and love the heart of the Voskamp family as they give all their gifts away). But we are settled that we are aiming for less- less presents, less expensive, less crazy, less Santa, less presents (I already said that… but seriously, less presents). And we’re also aspiring to more- more worship, more giving, more gratefulness. 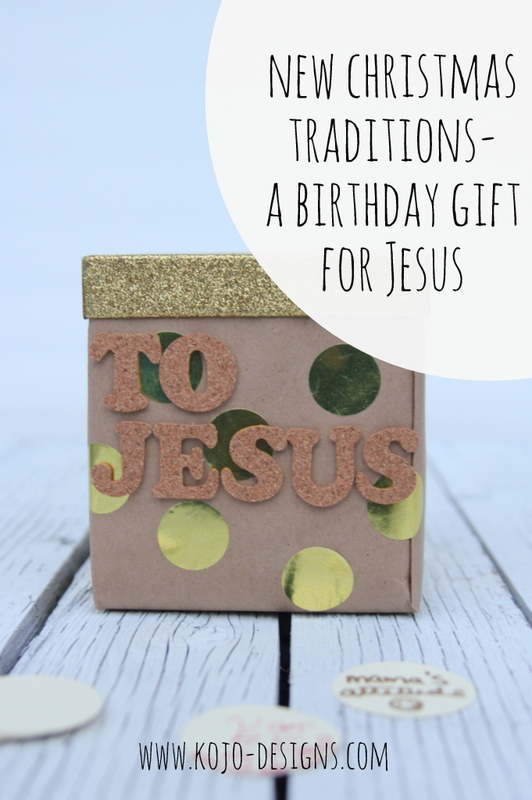 Along these lines, we’ve started a new tradition- a ‘Birthday Gift for Jesus.’ During December, as we think of different things we can bring to our King as gifts (attitudes, kindnesses, tangible gifts to people who need them, etc. ), we are writing them down and putting them in a special slotted box. On Christmas morning, we’ll open this present first. Hopefully it’ll be a way we can reorient our hearts this month, and also on Christmas before we open our much-smaller-this-year pile of gifts for each other, toward the true meaning of Christmas. 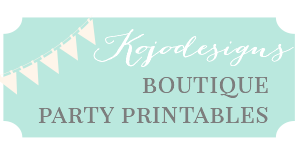 I’d love to hear the ways your family takes it down a notch for Christmas- do share! ps- True confession, “Mama’s Attitude” is in there twice already (as previously noted, it’s only December 3rd). 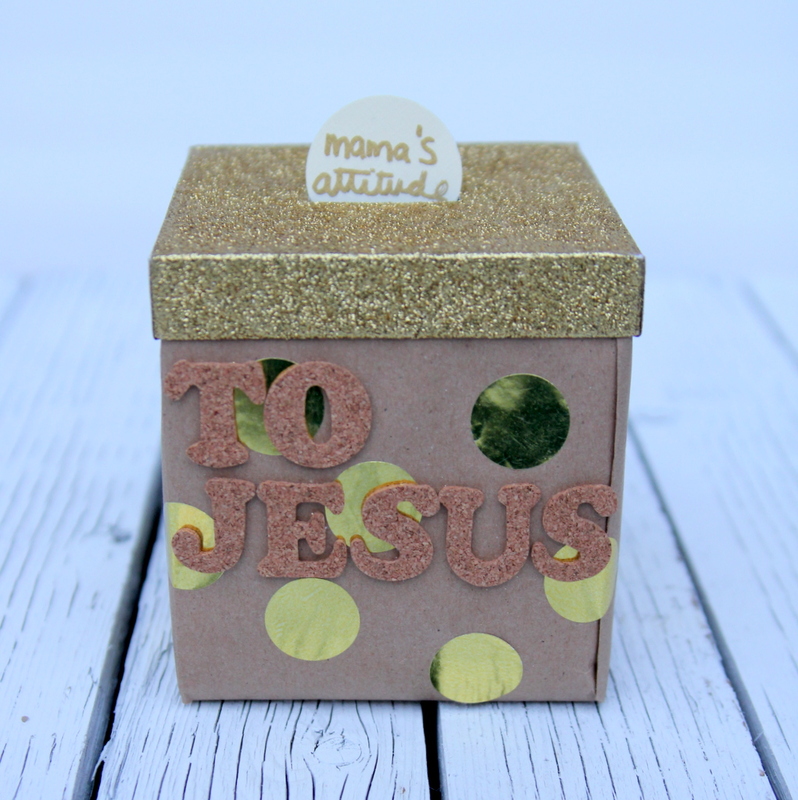 We do a similar Gifts for Jesus box, but our twist is writing down when we see someone else being kind/serving others. It’s been a crazy year and I don’t have the box out yet. I’ll have to try to do it today. I love reading them out loud on Christmas day and we love looking at past years too! What a great idea Nicole! My kiddos were so sweet to each other this morning- I’ll have to write down what they were doing and put it in the box. Thanks for the idea! I couldn’t agree with you more! I hate to admit it, but I’m having a hard time getting in the Christmas spirit this year. Perhaps it has something to do with the 3 week old baby and moving in 9 days? 😉 We don’t have any decorations up of course, but I hate the my 3 year old is asking for a tree. Clearly, I still want this to be a special time for her. 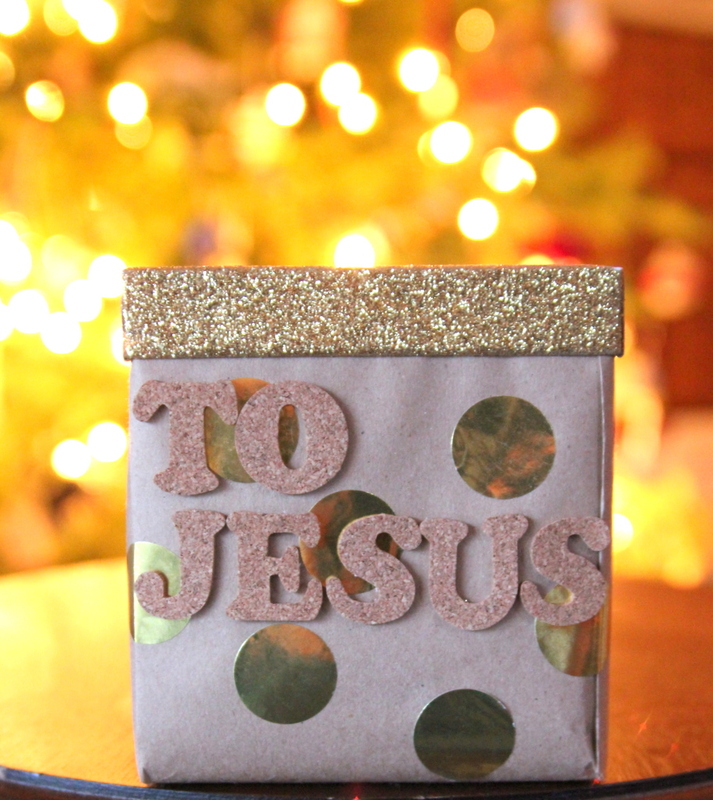 I love the gift for Jesus (and will probably steal it next year!). I also just came across this idea on Pinterest that I plan to do next year. Nothing against the Elf on the Shelf, but to me, it’s still missing the point. I love the idea of teaching my girls about kindness, especially during the Christmas season, more than them worrying about being good for an elf. Oh buddy, I’m sorry it’s been a tricky season! That’s a TON to have on your plate right now. Grace and more grace, friend. Heather, I wish I didn’t know that overwhelmed feeling so well- UGH. And, yes, isn’t such a relief (and responsibility) to remember that He is after our hearts above all else? 🙂 Sometimes I like the ‘checked boxes’ mentality that comes with mere actions, but, truly, the yoke is light to realize that the Lord is much more concerned with my heart. Glad this was encouraging to you! OOOOO how I wish I would have come across this about 16 days earlier! My boys are very young still and this would be a great tradition to start now and really teach them the meaning of the season. Pinning for next year! lovely – thank you. and thank you for the link to the voskamp blog – touching, and convicting. Ann, I love that post (and her whole blog!). It’s after Christmas as I am catching up on some internet time and reading this. We did the same kind of idea last year on Saipan, and even more so this year as we returned home only 10 days before Christmas. We had few winter clothes, as you know, and other needs, so clothing and such were our gifts this year. I love thetime and thought you and Adam put into raising your sweet kiddos. They will thank you one day! We attended multiple Christmas services this year at multiple churches, and this may be my newest tradition. Each had a different feel, and the messages were all just right. I was moved to tears repeatedly by music, Scripture, Mary’s faith, and God’s gift and grace. Guess I am old enough now or something that I just let the tears roll. I have never felt so blessed and I just bet you have felt some of the same! LOVE the idea of attending multiple church services! What a great tradition!